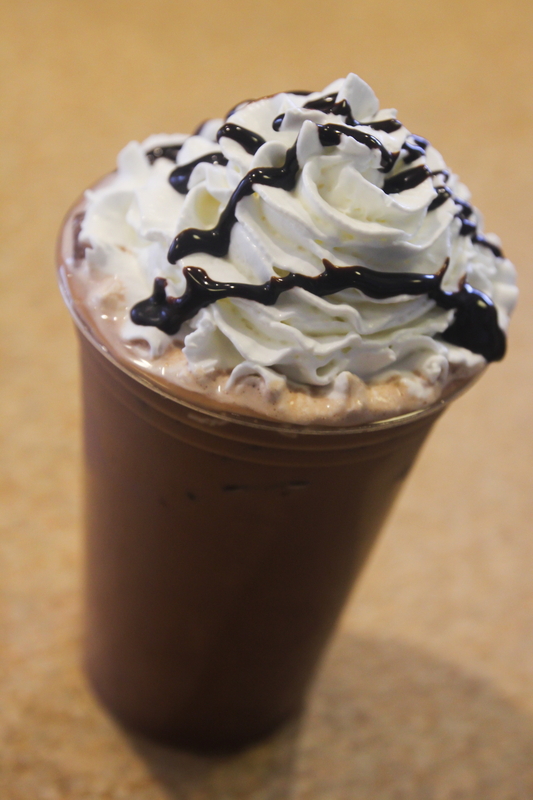 hot or cold – such as the iced mocha below. Scott and Shirley Rogers have been in the coffee business for more than 10 years. Between 2004 and 2014, their coffee shop at Oakwood Mall, Gloria Jean’s, purveyed the creative coffee experience Eau Claire folks were seeking to fuel their shopping trips. When their lease was not renewed at the mall, the Rogerses closed up shop and considered other coffee possibilities. As their store closed, Scott and Shirley became empty nesters and had the freedom to explore their next venture. A opportunity soon arose in Chippewa Falls. 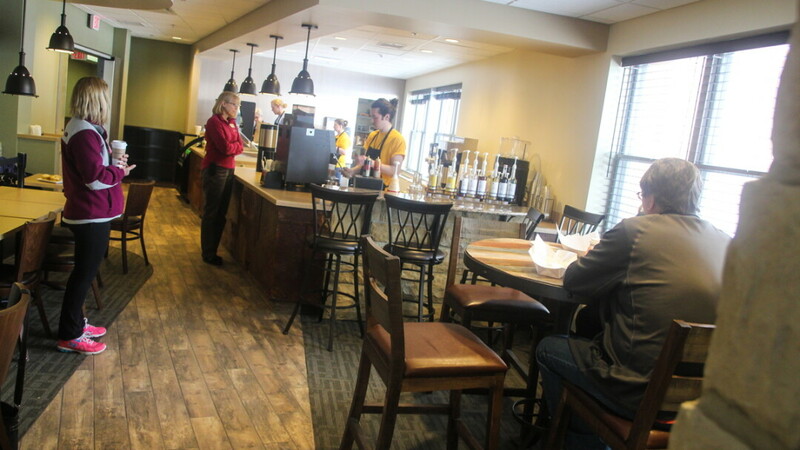 “We were searching for people who had experience in the coffee business,” explains Sarah North, administrator of Wissota Health and Regional Vent Center in Chippewa Falls. “The invite came to light because we knew the Rogerses were reputable owners and operators of a coffee destination in Oakwood Mall for many years. We placed a phone call to the Rogerses and conversations about the opportunity ensued.” It took well over a year to hatch the idea. In a space previously occupied by a therapy gym, High Bridge Coffee House & Cafe would fit nicely into the physical space and meet the community need for good food and gathering on this multi-building campus in Chippewa Falls. Located on County Highway I, near Cray Inc. and Seymour Cray Sr. Boulevard/Highway 178, you’ll find this quaint coffee house tucked into one of the resident buildings there. “High Bridge Coffee House & Café fulfills a very unique niche for this area of the city and is within walking distance of many medical offices, clinics, a hospital, and other business types as well,” North expounds. A take-out parking spot and proximity to the Old Abe and Duncan Creek trails should help to bring visitors to this corner of town. Scott talked at length about what makes for good coffee. “We want to give our guests a special experience centered around coffee,” he enthused, “especially great quality flavors, a comforting atmosphere, warm personal service, and some unique, community-centric features.” Beans are sourced from different regions, including Peru, Ethiopia, Indonesia, and Mexico, dependent on the flavor being sought. The beans are then roasted by a small roaster in Hayward whose turnaround can be as quick as two days per Scott’s specified roast profile. Scott and Shirley know regional coffee drinkers enjoy flavored brews and seasonal drinks; the coffee menu includes Mexican Fair Trade Organic Coffee brewed in the 18-hour cold press method, flavored with one of four current flavors, served hot or cold. Coffee seminars on regions and roasting will soon be available so you can glean more info from High Bridge. The foundation of their business is quality of coffee and a positive experience, and an invitation to bring those beans home to continue the enjoyment. Curious customers can find a fresh food menu on Facebook daily. Shirley and crew are making handcrafted sandwiches and homemade granola, and there is always a gluten-free edible on the menu. Coffee enthusiasts will be impressed with the to-go French Press cup, a quality four-minute brew. Small plates will soon be available in the afternoon for a workday pick-me-up or after-school treat. High-quality local ingredients are being sourced from Yellowstone Cheese in Cadott and Deutsch Family Farm of Osseo, among others. The interior design was tailored to reflect a trending industrial look crossed with the warmth and comfort of a coffee house. Inspiration came from a favorite photo of Scott’s, taken in the 1890s, showing a locomotive traveling above the Chippewa River on the high bridge in Eau Claire, formerly the Chicago & North Western rail line. Todd Sauerwein of Holcombe was brought in to craft the space’s double-sided hearth in a profile that matches the stone trestle supports of that pictured bridge. Plush chairs are positioned next to bookshelves for individuals and a large banquet table is awaiting friendly book clubs.